Zimbabwean President Emmerson Mnangagwa arrived for a meeting with Russian leader Vladmir Putin at the Kremlin on Tuesday seeking loans from Russia but left with a stack of agreements on military cooperation and stemming money laundering. Russia also showed renewed interest in mining platinum in Darwendale and selling its fertilizer to African markets. The two men spoke as Zimbabwean cities resembled ghost towns, a day after deadly protests against a 150 percent fuel price increase Mnangagwa announced on Saturday before flying to Russia on Sunday. The Zimbabwe Congress of Trade Unions called for a three-day shutdown which started on Monday and urged workers to stay at home. But in protests on Monday, police and soldiers opened fire killing at least eight people and wounding over 30 others, according to the Zimbabwe Doctors for Human Rights. Rights groups said troops and armed police officers were carrying out door-to-door raids in urban centres on Tuesday to smoke out individuals suspected to have taken part in the protests. The government also shut down the internet, it is thought to stop social media discussions of the excesses of the security forces. Mnangagwa's trip to Russia, which began Monday, was planned before the protests erupted. He is also scheduled to visit Kazakhstan, Belarus and Azerbaijan before flying to Davos, Switzerland, in an effort to raise investment. "I can't say that we want this much or that much," he said in an interview with the state-run Russian news agency RIA Novosti published Tuesday before the meeting with Putin. A Kremlin statement released at the end of the meeting made no mention of loans and Moscow has in the past been reluctant to bail out struggling allies, though Russia has recently been building ties in Africa. 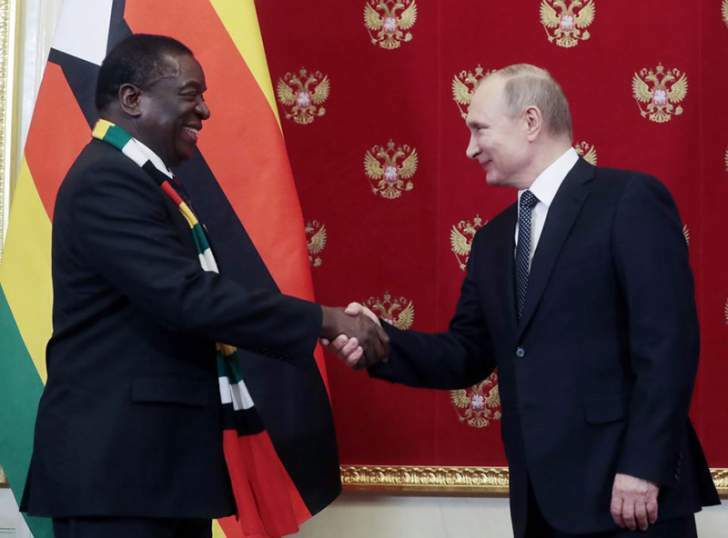 Russia is "ready to do everything that depends on us" to ensure its cooperation with Zimbabwe makes "a significant contribution" to government programmes, Putin told Mnangagwa at the start of their talks, without mentioning money. Mnangagwa said he wanted to focus on economic ties, as political cooperation was already well-established. In the RIA interview, Mnangagwa invited Russian companies to discuss investing in oil and gas projects in Zimbabwe, as well as in the energy sector. Russia's state-owned diamond giant Alrosa PJSC on Monday announced plans to return to Zimbabwe to develop new mining operations with the support of the government. The Kremlin statement said: "During the talks, the participants discussed matters pertaining to promoting bilateral relations and current international and regional issues. "Following the consultations, an exchange of documents signed during the official visit of the President of Zimbabwe to Russia took place in the presence of the leaders of the two countries. "The signed documents included an agreement between the Russian Federation and the Republic of Zimbabwe on extradition and an intergovernmental agreement on mutual protection of intellectual activity results and intellectual property protection in the course of bilateral military-technical cooperation. "The signed documents also concern cooperation in the sphere of countering the legalisation (money laundering) of criminally obtained proceeds and the financing of terrorism, the project for developing the Darwendale platinum group metal deposit and the supply of fertilisers to African markets." From Libya to Madagascar, Russia has been carving out a niche in Africa in part by shoring up strongmen in unstable but potentially rich states. The Kremlin has made the region a focus of its efforts to reassert geopolitical prowess and open new markets for domestic companies hamstrung by Western sanctions. Putin will host more than 50 leaders from the continent for the first Russia-Africa summit this year.